We supply very high quality Iceberg Lettuce Seed & we specialize in Iceberg Lettuce Seed Out Door. Seeds are imported from RIJK Zwaan Export B.V The Netherlands. Foliar application of 0.1 to 0.15 Solution (1 to 1.5g per liter of water) during critical growth stage. Higher or lower concentrations can be used defending on the nature of crops and their requirements. Give 2 to 3 sprays at 15 to 20 days interval at flowering/fruit setting stage. 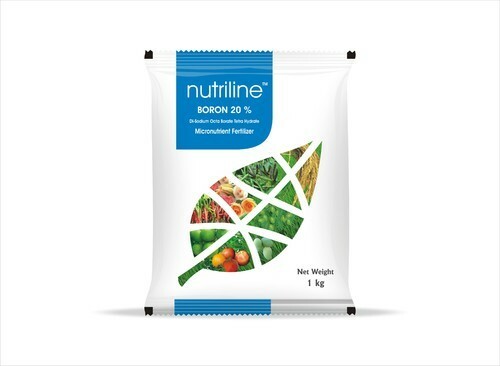 Nutriline Boron is also suitable for soil application or mixing in water. Contains water soluble boron (B) 20% min. When there is acute deficiency with obvious symptoms, several treatments at the higher application rate should be carried out at 7-15days intervals. For prevention, repeated treatments with the lower application rate are sufficient in phase of vigorous growth or when the yield is forming. Add 0.25gm to 0.75 gm per liter of water depending upon growth stage of plant. (Calcareous) 7-9 kgs/ha per hectare per application. Repeat where necessary every 10-15days continuous (proportional) Application. 15-30 grams per cubic meter of irrigation water. Foliar Application: Dissolve 100 gms of Nutriline-Zn-12% in 100 liters of water and spray on both sides of leaves. 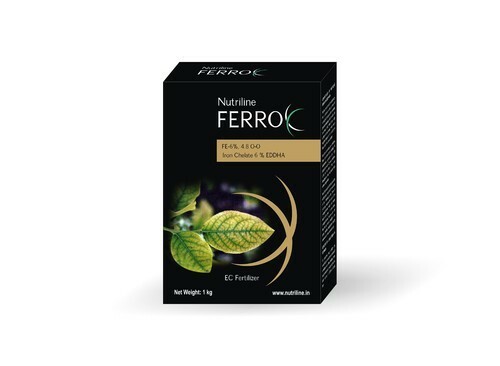 Fertigation: 500 gms of Nutriline-Zn can be mixed with water soluble fertilizers per acre. Soil Application: Mix 1kg of Nutriline-Zn in 10kg of soil and apply uniformly on one acre. Zinc content (expressed as Zn) percent by weight minimum in the form of Zn EDTA – 12%. Nutriline zinc chelated is easily translocated within the plants, because unlike zinc sulphate it is partly systemic. Nutriline Zn EDTA is available to plant system very quickly. 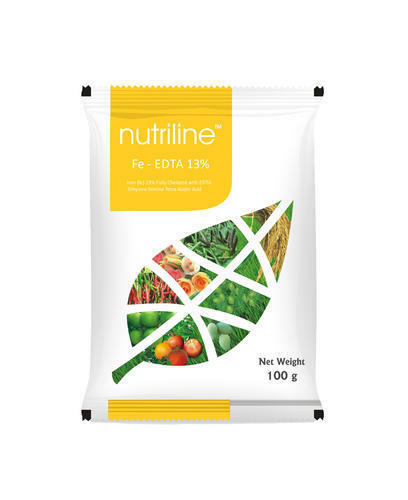 Nutriline Zn EDTA can be used on wide range of soil pH (5.0-10.0) to prevent permanent deficiencies. Uptake of nutriline Zn EDTA by crops is more than 80-90 percent compared to conventional micronutrients. Hence saving in micronutrient requirement up to 26 to 40%. We are the supplier in providing a wide range of of Fe-EDTA micronutrient.